Next time you’re cruising through Moore, keep an eye out for a big red bull’s eye in the sky. No, it’s not a shooting range — it’s heaven on earth for southside shopaholics and families alike. 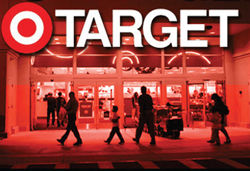 Oklahoma’s newest Target store, located at 720 S.W. 19th Street, next to Home Depot, opened last month. This location marks the second Target on the southside, and the only one worth visiting. In the past few years, the state of south Oklahoma City’s flagship store at 44th and Western has greatly deteriorated. What was once a family-friendly shopping experience transformed into a haunt for gangbangers and other undesirables. It became the kind of place you didn’t want to be caught in come nightfall. However, this new store hits the mark. From the moment you step through the automatic doors, the experience is unlike anything you will ever find at other mass retailers, including other Target stores. The store associates are cheerful and friendly, often asking if you need any help rather than just trudging by you as if you are invisible. They even wheel out shopping carts for you, making you feel a bit like royalty as you stroll about the store. And even though you might feel like a millionaire, you won’t have to dole out cash like one. If you’re looking for a high-quality wardrobe on a low-quality budget, look no further than Target’s clothing departments. With tees starting at $8 and some jeans as cheap as $15 a pop, Target offers Walmart-priced attire at a much higher quality. But Target is much more than a clothing store, selling everything from Rachel Ashwell bedding to dishware and school supplies. This new location even boasts a grocery section akin to the Walmart Neighborhood Markets. You might not find any car tires down the same aisle as your hamburger meat, but is that really such a loss anyway? And when you’re done shopping and your stomach is rumbling, you can stop by an expanded eating area that includes all the old standbys like hot dogs and pretzels, as well as a Pizza Hut that sells personal pan pizzas for $4.99 each. There’s even a miniature Starbucks that sells coffee and tea if you’re hankering for a caffeine fix. Whether you’ve lived on the southside all your life or you’re just driving through Moore, you have to make a stop at the big tan building with the unmistakable red sign.